On behalf of the Hartsville Fire Department, I hope that you are off to a great start for 2019. The Hartsville Fire Department is proud to serve you each year by providing service to you as needed. We never hope to see residents by going into their homes and businesses, but we are grateful for the trust that you place in our department to keep you and your property safe every day. It is our goal to always keep you informed of any changes that may occur within our department that will ultimately affect the people we serve each day. On January 8, 2019, Hartsville City Council passed an ordinance that impacted the department by implementing fees associated with false alarms in homes and businesses. Over the last few years, we have seen a significant increase of the amount of false alarm calls that are made within our Fire District. A false alarm is defined as a call that is made from an individual or alarm system that was made in error or due to faulty system. 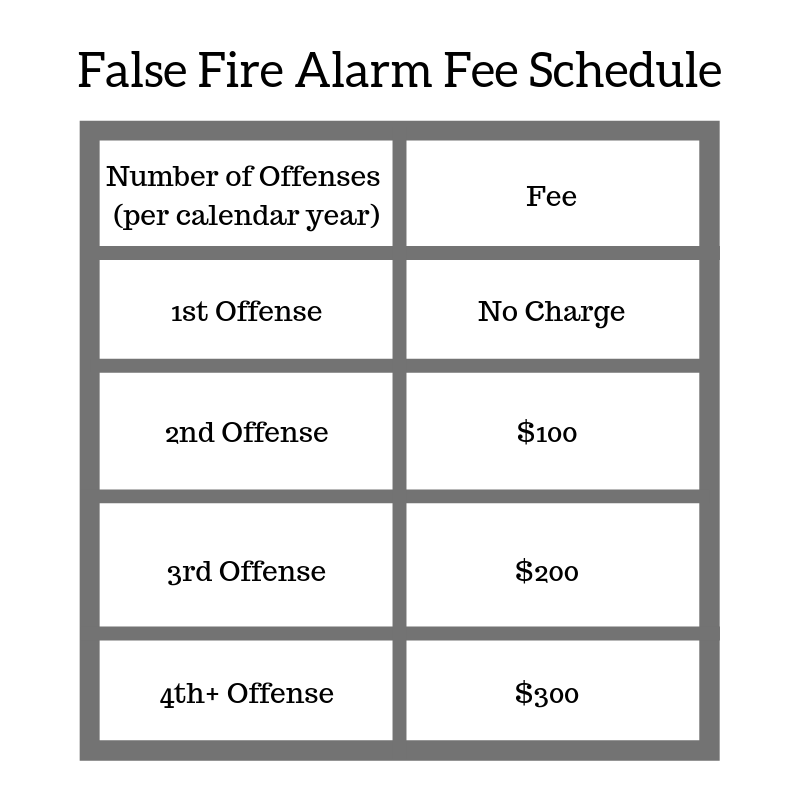 The fee schedule for these false alarm calls are listed below. In 2018, our department responded to a total of 219 false alarms in our district. Responding to such a significant number of false alarms each year is costly to our department and to those that we serve. We would like to work together with the community to alleviate the number of false calls. You can take preventative measures in your businesses and homes to ensure that you do not have any false alarms. Remember to service your alarm systems often. We recommend servicing your systems once every six months. It is also helpful to educate the users of your alarm systems on how they operate to prevent user error caused alarms. Should you have any questions about this or any other fire prevention methods, please feel free to give us a call.